Xerox has a branding problem. Consumers have always thought of it as THE maker of photocopy machines, but that’s hardly the full story. 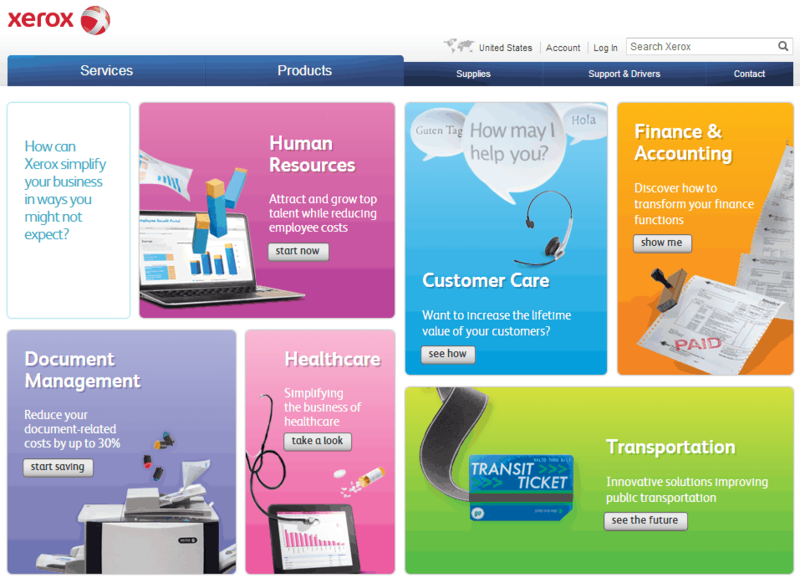 Did you know Xerox does IT Outsourcing and Business Processes? Surprised? I was too. Yet Xerox does far more than simply supply photocopiers. In fact, it provides services in a number of areas outside of document management. At the same time, the brand can’t seem to shake its legacy image — a name synonymous with photocopying — in favor of recognition as a leader in business services. But it is certainly trying. In attempt to change the perception of its brand, Xerox has turned to content. To understand how Xerox uses content for branding and marketing purposes, we interviewed Ken Ericson, a former TV journalist at The Associated Press now serving as Xerox’s Director of Content. “One of the largest tasks that we have through our content is to be able to change the perception of our brand,” shared Ericson. 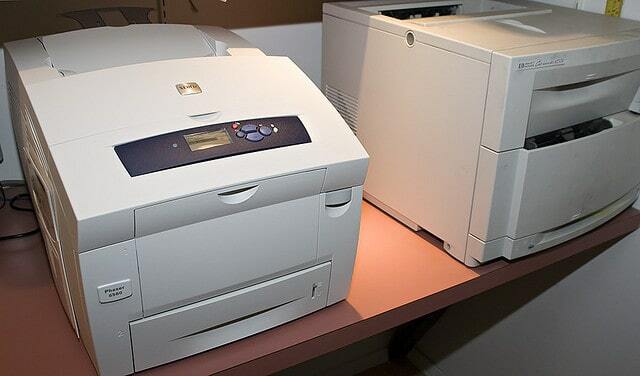 The truth is, Xerox doesn’t really have an identity crisis. Rather it has a brand crisis. The corporation knows exactly what it is — a leader in business services — yet most of the world still sees it as a copier-printer business. According to Ericson, the printer and copier machines make up 1/2 of the Xerox business, as far as revenues are concerned. External columns — The company works with Forbes and The Week to produce content for two branded columns XeroxVoice: Simplifying How Work Gets Done and Business Made Simple. Given the business’ focus on multiple industries and unique customer segments, this makes sense. Unlike other businesses, Xerox can also easily finance the operation of 13 content initiatives. I dialed into the conference call hoping to uncover hidden gems about how Xerox invests in content and to understand how much measurable success the team has seen from its content campaigns. Of course, believing Xerox had an infinite pool of money to throw at programs that would rebuild the brand’s image, I repeatedly pressed Ericson to share his secrets for driving outrageous amounts of pageviews to content presented by Xerox. Throughout our conversation though, I got the sense that traffic simply wasn’t a big focus for Xerox, which seems counter-intuitive since content marketers tend to put heavy emphasis on just getting more traffic. I mean, businesses such as Virgin Mobile sponsor posts on sites such as BuzzFeed through “native ads / sponsored stories” specifically because of all the traffic those stories are expected to (and, ultimately, do) receive. Naturally, I was still curious about the amount of traffic Xerox content received. Only Xerox’s Forbes column offered any visibility on pageviews though. 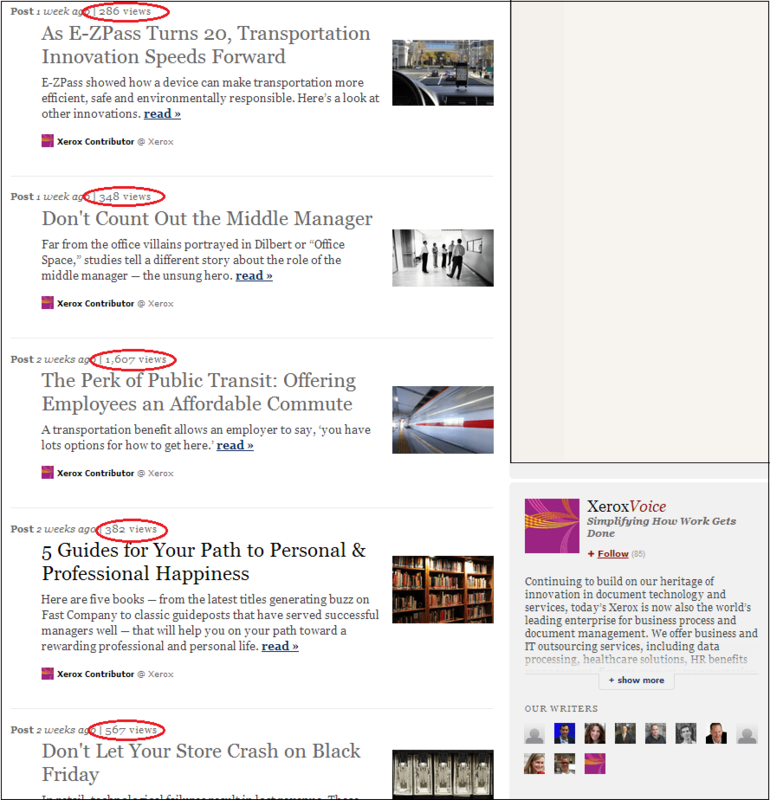 The below screenshot tells us Xerox’s 5 most recent stories averaged ~640 views. This is hardly anywhere near the amount of pageviews an average post on BuzzFeed generates, but, as far as blog posts go, Xerox’s numbers are nothing to scoff at. In fact, plenty of blog posts go completely unread and unnoticed in cyberspace. At the same time, posts published to Forbes are generally likely to drive more pageviews than your average blog post (thanks to the credibility Forbes provides it authors and the distribution on Forbes.com). Also, my limited personal experience observing views counts on other Forbes contributor columns suggests an average of ~640 views per post means there could be further room for improvement (at least on the promotion end). Yet, despite unimpressive numbers, Xerox seems to be content with its content — the team measures engagement more actively than it does traffic and pageviews. Xerox’s content team essentially runs like a newsroom, shared Ericson. Writers stay up-to-date with current trends and issues in order to develop topical content for readers. What is especially interesting about Xerox’s content strategy is much of its content is sourced by freelance journalists, individuals who know how to research and write a powerful story, which makes the focus on quality easy. The materials Xerox’s “newsroom” outputs can hardly be called ‘marketing’ since there is rarely any mention of Xerox or its products and services. Aside from branding content with the Xerox logo and, sometimes, the unobtrusive phrase “presented by Xerox,” the company does virtually no ‘selling’ in its content. “The goal is to have permission to be involved in the conversations,” said Ericson, who is proud of the metrics they’ve achieved. “We do have a high loyal reader rate.” Many readers return to Xerox’s sites to consume the latest news, reports and stories. “One of the things that we have found is people have come back to the site and we have become a trusted resource in the space, which is something that we’re proud of.” Above all, Xerox values engagement and influence. Xerox doesn’t throw around its weight by paying absurd amounts of money to drive traffic to every piece of content it publishes. Rather, it focuses on organic growth and produces a lot of unique content across its 13 content programs to engage smaller, niche segments. And that’s probably a good thing for the business. Let’s look at one of the content channels Xerox manages and see what Xerox is doing to connect with real people and change its brand image. At the HealthBiz Decoded microsite, Xerox focuses on a very specialized audience — healthcare administrators and operators. With a specific audience in mind, Xerox does well in limiting the breadth of its content, thus enabling Xerox to really cater to its readers and effectively engage and influence them. From what I could gauge from our conversation, Ericson was pleased with what the team has achieved at Xerox, especially with HealthBiz Decoded. Xerox has joined “the conversation in a trusted way,” developing a meaningful digital footprint in the healthcare space. Between the distributed content plays at Forbes and The Week, and its social channels, Bartlett says that the company is nearing 1 million subscribers, publishing thousands of pieces of content per month and reaching almost 10 million people each month. The Xerox team makes sure to share any new content via social media, targeting influencers. This is an especially useful tactic, at least for HealthBiz Decoded, because Xerox has “a pretty good healthcare community that follows us in that space, and we tend to see that stories travel well within that community and that helps us out a lot,” said Ericson. 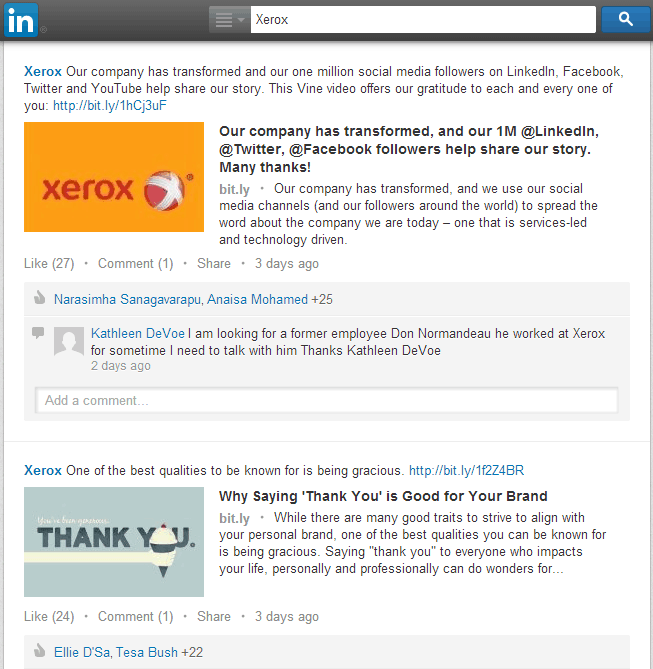 Also, Ericson pointed out that, for Xerox, LinkedIn is a powerful network. 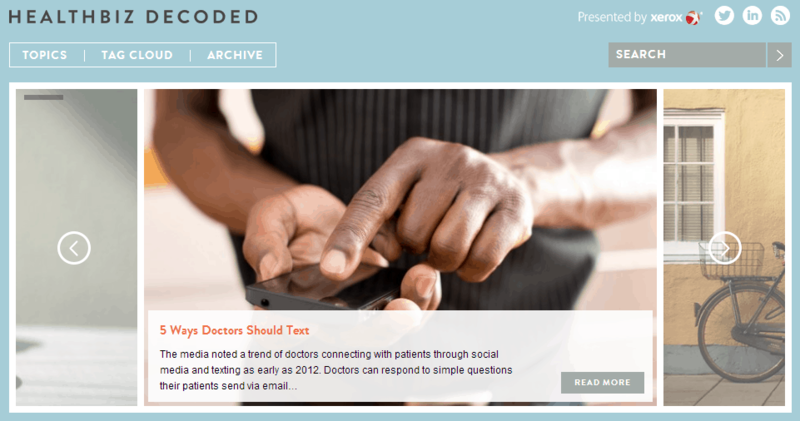 There, the company engages with and demonstrates its thought leadership with healthcare professionals. Given that most of Xerox’s content marketing programs are less than a year old — RealBusiness.com, its newest publication, launched in October –, there’s still a lot of work Xerox needs to do and many lessons it will need to learn. Wearing the hat of publisher is a major shift in the way we traditionally approach marketing and communications. Change is never easy and every day we’re learning what works and what doesn’t. Most of all we’re willing to experiment, to fail and to try again – all with the objective to shift legacy perceptions of Xerox and associate our story with content that connects. Xerox is just one example of a big brand evolving with the times and turning to content marketing to help build the business and educate consumers. The brand’s efforts seem to be paying off. This year, Xerox ranked #4 in Kapost’s list of Top Content Marketing Brands. Ericson has a lot of work cut out for him if Xerox wants its brand to be well known throughout the entire healthcare and business services industries. Given the firm’s success to-date and its resolve to create content with a strong editorial focus that is valuable to users, Xerox will likely shed its legacy brand image and properly position itself as a known leader in healthcare and business services in the coming years. If a brand with more than 100 years of history, known exclusively as THE copier-and-printer-maker, could use content to update its brand image, think about the possibilities content marketing holds for your business. What’s your content marketing success story?